Remove the inner part of snake gourd and chop the outer skin. 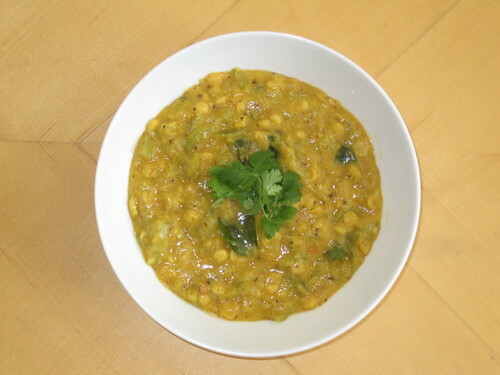 Wash and soak mung dal and chana dal in water for fifteen minutes. Add both dal in cooker with requried water and snake gourd on top of dal. Pressure cook the dal with salt and turmeric powder. Give 4 whistle as 2 whistles in high flame and 2 whistles in low flame. Heat oil in a pan,add urad dal,redchillies,cumin seeds and fry it. Grind both grated coconut,fried tadka (above said step) and tomato to a paste. Heat oil in pan add mustard seeds,hing,curryleaves and add to cooked dal. Now add ground paste to the cooked dal, mix well and cook it for 15 minutes till raw smell of coconut goes off. Garnish with coriander leaves and it is done. 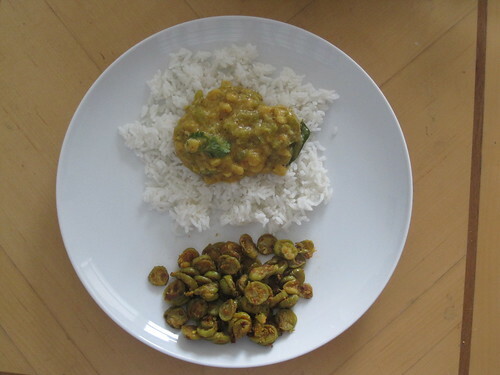 Snake gourd kootu can be served with hot rice and chappati. I served kootu with Ivy gourd fry. It is wonderful combination with rice. I did this by referring Lavi's Ivy Gourd Fry. Thanks to her for recipe.